I love seeing this Cue Card! BUNNY means Easter and that means Spring is coming, Yipeee!!!!!!!! This weeks sponsor is Cindy Coutts. She is giving away two awesome prizes!! This weeks winner will receive a $25 gift certificate to Inspired by Stamps!! One Random Participant - free Clean & Simple Card Class by Cindy (Apr. 22-26)!!! I hope you'll join us this week. I can't wait to see your cards for this weeks challenge! The design team has some great BUNNY cards, so visit them too for even more inspiration! Awesome cue word and card Mo! I love this bunny!!! Very cute! This is just the sweetest bunny ever! Love the monochromatic color scheme and that little embellished tail is so cute!!! I LOVE the pink and white colour combination you used! And that sweet little tail....cute! What a great bunny card! Maureen your card is just so sweet. I love the pink and the tail is so cute with the heart on it. You always make CAS look so effortless! Adorable - love him all in pink! Maureen, this is springy perfection! LOVE this cute card, especially the pink! There's something about fluffy bunny butts that always makes me smile! :D Love the pink scallops too. So adorable...love the happy colors! 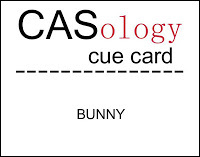 the perfect CAS Easter card!! I adore the heart ob his little tail!!!!! I think this is probably the cutest bunny card that I've ever seen, I love it! Totally love this darling card! 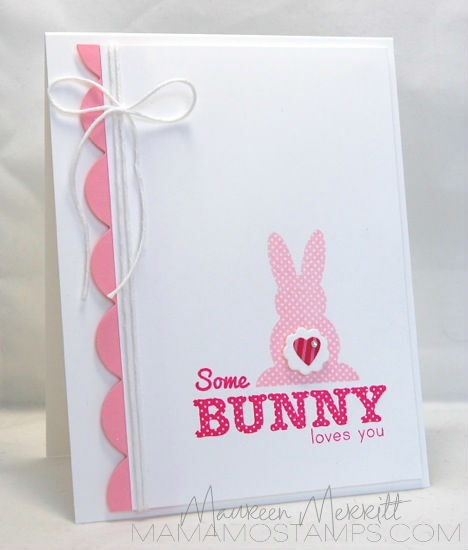 Love this sweet bunny and all of the shades of pink! Great card with impact in the shades of pink. Lovely.